Writer, editor, publisher and entrepreneur, Zafar Anjum is a man with a vision. The desire to draw global attention to Asian writing and writers led him, in 2005, to found Kitaab. In the decade since its founding, Kitaab has expanded in many directions. This month, in another step forward, Kitaab, has decided to take its mission to the next level by launching a crowdfunding campaign. Indian Short Story in English(ISSE) spoke to Zafar Anjum about the launch and related matters. ISSE: Please tell us about your mission and the journey of Kitaab from 2005 to 2015. Z.A: I founded Kitaab (which means “book” in many Asian languages) in 2005 in Singapore to empower and connect Asian writers with readers globally. 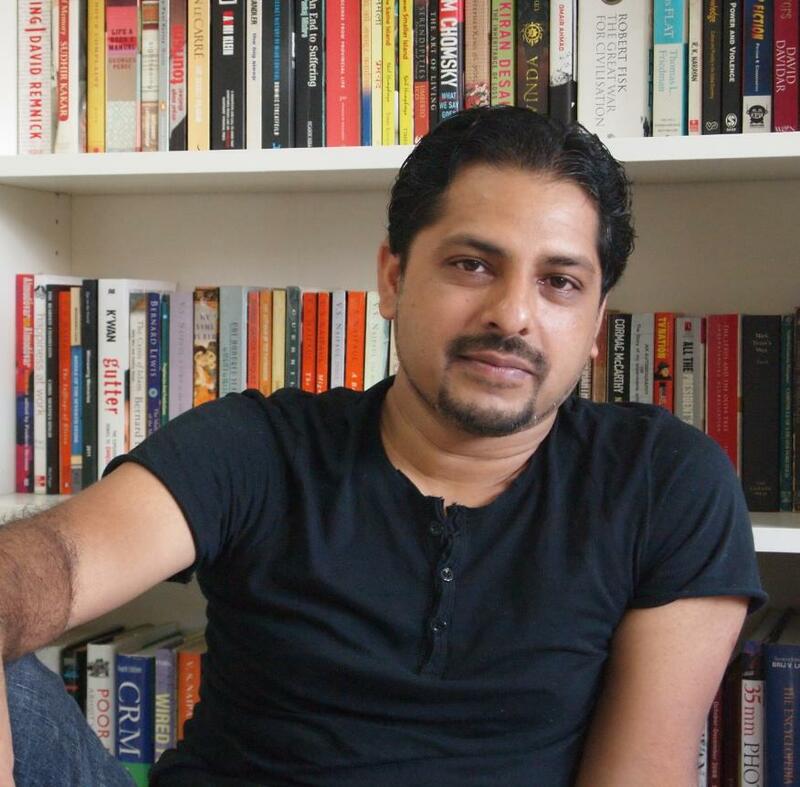 When it was launched 10 years ago, Kitaab filled a major void in the online literary scene in Asia by creating a link-based information storehouse where the most important stories on Asian writers and writing were carefully curated. For a time, Kitaab was merged with another literary website which became defunct after a while. I decided to revive Kitaab and relaunched it in 2013 as a global writing and publishing platform for emerging and seasoned writers in Asia and abroad. Over the years, Kitaab has evolved into a much larger project that encompasses publishing and e-commerce to serve the same community of writers, readers, publishers and agents worldwide. Now, it is run by 15 voluntary editors who sit in different parts of the world. It is supported and guided by some of the finest writers in the region including Amitava Kumar, Kunal Basu, Anees Salim and Suchen Christine Lim who sit on Kitaab’s editorial advisory board. Kitaab is also getting recognised in the region. Recently, it was invited to be the media partner of the Hyderabad Literary Festival in India. Kitaab has published some of the region’s best writers and poets such as Yeow Kai Chai, Desmond Kon, Yong Shu Hoong, and Jee Leong Koh, amongst others. Kitaab has published interviews with over 100 Asian writers from around the world including Tan Twan Eng, Anees Salim, Amitava Kumar, Salil Tripathi, Suchen Christine Lim, Prajwal Parajuly, Romesh Gunesekera, Ken Spillman, Mahesh Rao, Meira Chand, Ovidia Yu, Shashi Deshpande, David Davidar, William Dalrymple, Shashi Tharoor, and Isa Kamari, among others. In 2013 we marked our foray into publishing. Now we want to launch an e-marketplace to sell our books and books by other publishers on Asian themed content. ISSE: Could you tell us about your role as a publisher and as a crusader for authors’ and human rights? Z.A. : Being a writer myself, I could feel the pain of my fellow writers. Mainstream publishers usually go for books that help their bottomline. We don’t have such compulsions. So, we thought we should enter this space to support good writers, especially short story writers, who are generally neglected by mainstream publishers. As a publishing house, Kitaab publishes original/translated contemporary literature in English and other Asian languages. So far, Kitaab has published five titles and a few more titles are in the pipeline by writers from Singapore, India and Hong Kong. Two of Kitaab’s titles were launched at this year’s Singapore Literary Festival. Kitaab will publish three books by Singapore’s Cultural Medallion winner Isa Kamari in 2016, including the Malay writer’s first novel written in English. Kitaab has also bought the Hindi/Urdu translation rights of Isa Kamari’s pathbreaking Malay novel, Intercession. We are looking to buy translation rights of many books from around the region, and even from the West. Kitaab has been on the frontline to speak for and defend authors’ right to dissent in a climate of censorship, and to seek gender equality and gender rights in particular and protection of human rights in general and has published numerous supporting stories from Myanmar, Bangladesh, India and China, among other places, to highlight such issues. We will continue to do so. ISSE: You have been quoted as saying “Kitaab has taken birth in the digital age, and we are embracing everything digital.” Please elaborate on this? Z.A: Kitaab is an end to end digital platform for Asian writers and readers. We work virtually, and all our 15 editors work from various locations. We distribute our physical books only through digital platforms like Amazon and Flipkart, and we will obviously do the same with our digital books. We are going to add crowdfunded publishing and an e-marketplace for books on our site. We have a decent social media following. So, as a platform we are very much digital. Tomorrow, when we launch an award programme, it will be a digitally transparent award system, not like most traditional awards that are more or less black boxes. We also plan to do virtual book releases using live streaming. These are some of things we want to do, God willing. ISSE: In what respects is your objective different from the crowdfunded publishing programs in the West? Z.A: The Western models of crowdfunded publishing are open to all, and they do a fairly good job. We are not competing with them. We are focused on Asian writers and Asian writing. While this diminishes our market size, we believe that we need a platform like this in Asia to connect our writers with readers in Asia and at a global level too. Asian writers can get lost in the vast global platforms which have traditionally been dominated by Western writers. In that sense, we serve a niche market but it is a huge market, which is growing fast. Also, as a point of differentiation, what we want to offer is end to end solution to our authors. On our platform, not only they can publish their content and books, they can also market their books here and sell them in our e-marketplace. It will be an alternative platform wherein LinkedIn, Amazon, Goodreads, and your New York Review of Books is all rolled into one–but only for Asian writers. The West is way ahead of us but we dream of such a space for our Asian authors. ISSE: We understand that Kitaab is offering perks to the contributors? Please list the perks. Z.A. : Those who will support Kitaab in our first-ever fundraising campaign on Indiegogo will be rewarded with various perks, ranging from thank you notes from editors to signed copies of books to specially designed tote bags and even mention on the Kitaab website as a patron. Our full range of perks can be seen here. ISSE: Which of Kitaab’s projects will benefit from the $ 10,000.00, the goal of the present launch. ISSE: As a forward-looking entrepreneur, do you have any objectives for future crowdfunding launches. ZA: Yes, we want to launch a crowdfunded model of publishing, besides our traditional model. We have some interesting projects in the pipeline but it is a little early to talk about them. ISSE: We wishes you, this and future campaigns great success. ZA: Thank you so much for your good wishes. We are grateful for this opportunity to talk about our work and our Indiegogo campaign. God bless you! ISSE: God bless you and your work too! Kitaab is doing a lot for Asian writers, especially of the short story. All the best to him. I am so happy to have my collection of short stories published by Kitaab.